Leslie (Sam) Smart is a perfect exemplar of the practice of design and design education in postwar Canada. For starters, he’s from somewhere else. He was also a generalist, who worked the technical end of the type composition industry at Mono Lino Typesetting, taught night school at Ryerson College (now University) and had his own creative career as primarily a book designer. As Brian Donnelly, guest editor of this issue of the Devil’s Artisan, has written elsewhere, Smart’s approach reflects ‘the typical Canadian ambivalence to any specific design doctrines or movements’, and ‘exemplifies the practical application of traditional knowledge in classically modern ways.’ Smart was a keen student of history and thus, like design education in Canada generally, exemplifies the dominant if not always successful practice of studio instructors stepping in to teach studies courses or to write and lecture on design history. DA 83 features the work of Brian Donnelly, Lauren Holden, Simone Robert and Camilla Dinardo, whose contributions examine Smart’s role in transforming the landscape of Canadian graphic design, not only through his own design aesthetic but also through his engagement in design journalism. Also in this issue, Grant Hurley investigates the career of master printmaker Robert Van de Peer of the Sunbury Shores Arts and Nature Centre in St Andrews, New Brunswick. Stephen Sword contributes a review of Bed & Platen Book Printing Machines and Tim Inkster provides a delightful diversion with a short narrative about his hunt for the provenance of a particular decorative headpiece. Recurring features include the Rogues’ Gallery, featuring a profile of Robert R. Reid, and Richard Kegler’s discussion of Double Small-Pica Script. Kandid Kamera shares photos of an open house event hosted at Howard Iron Works Museum as part of Doors Open Halton. The front cover image is after a design by Leslie (Sam) Smart created for an Eaton's employee newsletter (1970). The keepsake is after a logo created by Leslie Smart & Assoc. for a promotional calendar (1773). 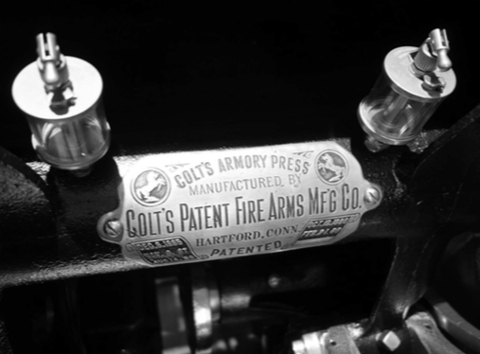 The maker’s plate on a Colt’s Armory Press (ca. 1888). Credit: Don McLeod.